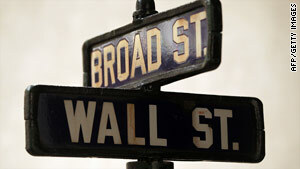 The famous Wall and Broad streets sign once stood in front of the J.P. Morgan and Co. bank building in New York. New York (CNN) -- A vintage street sign that once stood at the foot of the New York Stock Exchange in the late 19th and early 20th centuries -- a period known as Wall Street's Gilded Age -- was auctioned off Monday for a price befitting the neighborhood: $116,500. The enamel-engraved, cast iron-bracketed sign was mounted at the corner of Wall and Broad streets in front of the J.P. Morgan and Co. bank building, also known as the "House of Morgan." The bank, owned by the influential industrialist J.P. Morgan, was the site of the notorious Wall Street Bombing of 1920, in which a horse-drawn wagon packed with 100 pounds of dynamite detonated in the crowded financial district. Shrapnel scars from the blast are still visible on the sign. The attack, which occurred shortly after noon on September 16, 1920, left 38 people dead and hundreds wounded. At the time, it had been the deadliest terrorist attack on American soil to date. The perpetrators were never caught, but historians suspect radical anarchists were to blame. The bombing helped ignite the Red Scare that came to define the following decades. The intersection of Wall Street and Broad Street was again the scene of chaos in the wake of the Stock Market Crash of 1929, when crowds assembled outside the New York Stock Exchange in shock. Sung-Hee Park, a spokeswoman for Chrisite's Auction House, said the sale surpassed pre-auction expectations of $60,000 to $80,000. She said the buyer was a collector in Asia, and the bid was placed by telephone.